Good evening and happy (end of) Monday! I am very excited to now be a member of the Digit-al Dozen! 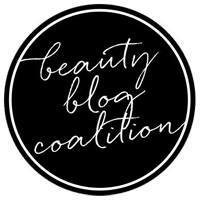 If you don't know what the Digit-al Dozen is, it is a small, diverse group of nail art bloggers who post on the same theme for one week each month. The theme to kick off 2015 is fairytales! I was excited about this theme when I first heard it but it certainly has proved to be difficult in translating to nail art! 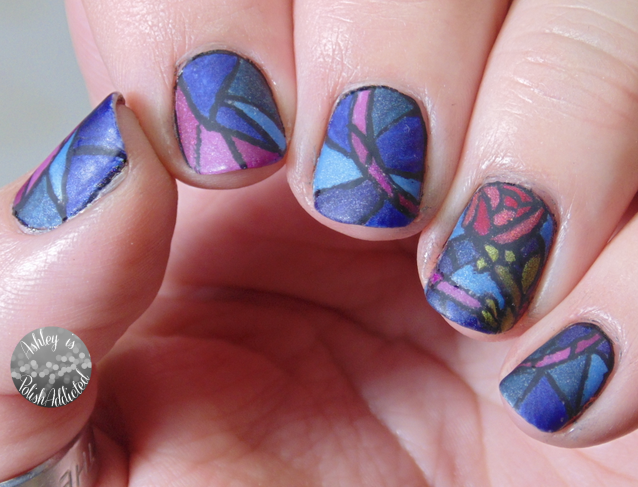 I am pleased with this mani. I based it off one of my very favorite fairy tales, and one of my favorite movies when I was a kid. (Who am I kidding? I still love this movie!) I took inspiration from a nail art blogger whom I have followed for a while, fellow Digit-al Dozen member Will Paint Nails for Food. She created this mani back in November and it instantly reminded me of Beauty and the Beast (even though her inspiration was something completely different) and I knew I had to try to re-create my own version one day! I'm sure everyone is familiar with both the story behind Beauty and the Beast, as well as the Disney movie, but in case you're not (I'm looking at you, Sheila! ), here is a quick synopsis. The Beast is actually a prince, and a very self-centered, selfish person. One night an old beggar woman comes to the castle and asks for help. He turns her away because she is ugly, only to have her transform into a beautiful witch. She places an enchantment on the whole castle, including turning him into a beast. She gives him an enchanted rose. He has the life of the rose to learn how to love, and earn someone else's love in return. If the last petal falls before this happens, he will remain a beast forever. 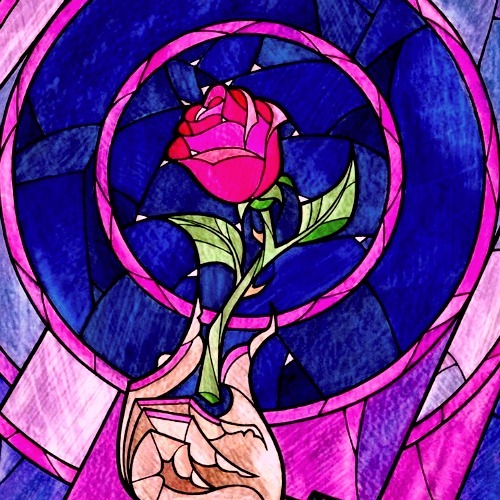 The rose in the photo below (my inspiration photo) is in the Beast's castle in the Disney movie. 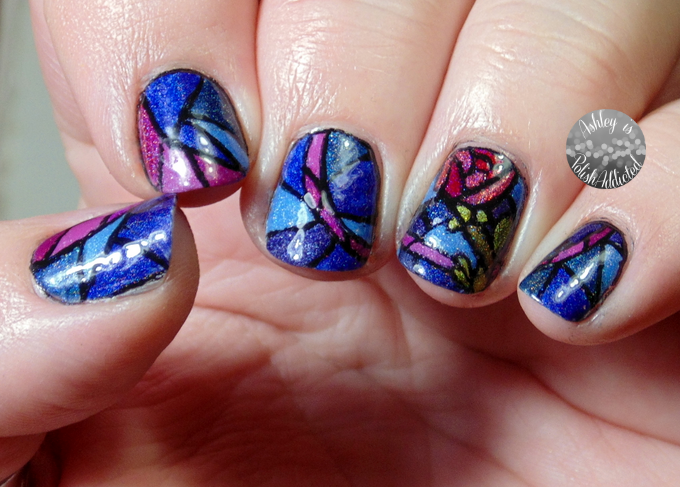 To create this mani I started out with the rose and used Will Paint Nails for Food's Stained Glass Tutorial. For the other nails I did a mix of the way she painted hers and doing them "backwards" (meaning I was getting lazy LOL). I am really happy with how they turned out though! You know I had to add a matte top coat. 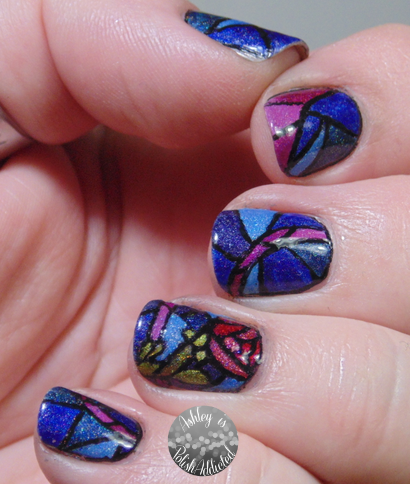 I actually preferred this one shiny though, since it looked more like stained glass with the sparkle. I will attempt to list all of the polishes I used. If there is one specific one you would like to know, ask and I will do my best to answer! Elevation Polish Ortler, Bromeliad and Sunset Among the Palms and Pahlish Lambrusco. The black was mostly acrylic paint, but some black creme polish was used as well. 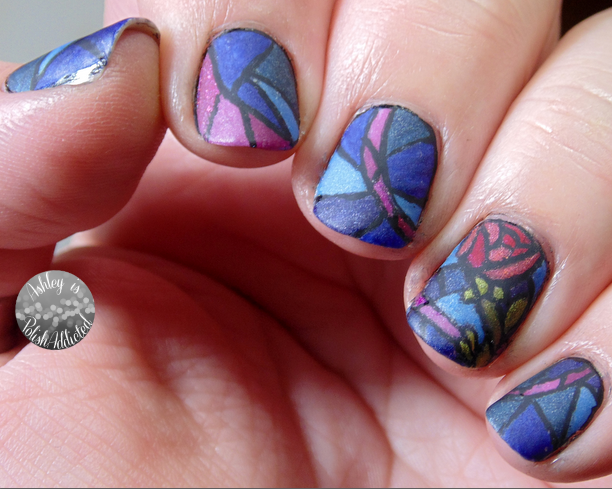 Make sure to check out all of the other amazing manis below! Great detailing Ashley! 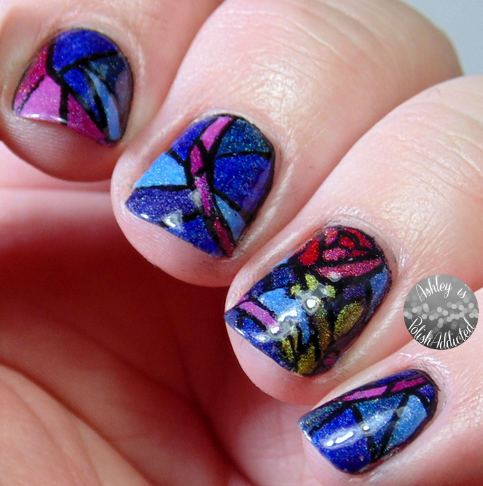 It really does look like stained glass! This is STUNNING!!! Great job and welcome to the DD! Your painting is amazing! I always love that opening scene from Beauty and The Beast. These look amazing! I love them! It's really a show stopper hun! Be proud of this first one for sure! Stunning! Fantastic mani for the theme! Can'y wait to see what you come upt with on the rest of your challenge mani's over the coming months!! These are insanely beautiful! Like, stars in my eyes right now! I loved Meghan's original mani as well and I think you've done a great job with yours! 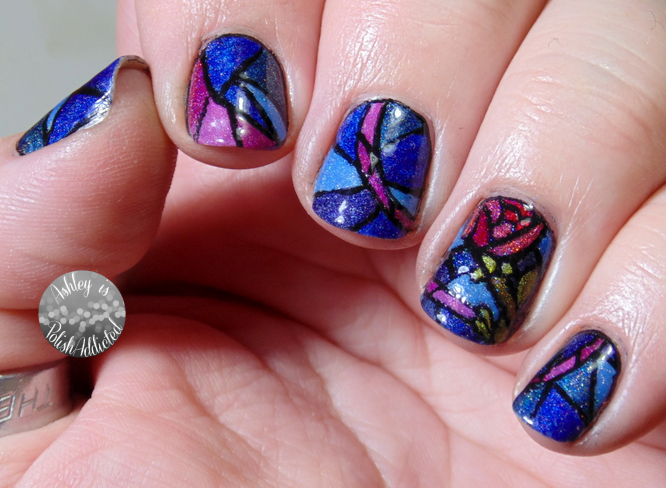 Perfect Beauty and the Beast stained glass!